Arran Henderson is the author of the Hidden Dublin column, He is a graduate in Art History from Oxford Brooks, where he also wrote as art critic for the main Oxford University’s award-winning student paper, The Word. Writing: Arran has reviewed for The Irish Arts Review; co-presented or guested on history and architecture topics on Dublin CityFM radio; and is the author of numerous articles on aspects of visual culture for various publications. He’s currently completing an activities book on historic Dublin for children and young people. Tours: Under the banner Dublin Decoded Arran also leads guided walking tours covering Art, Architecture and History in different areas of the city. 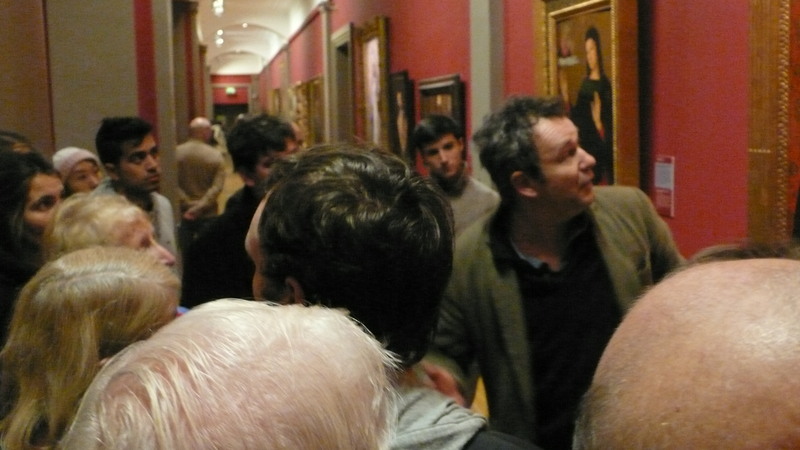 These include the well-known Art tour How to Read A Painting, a fun, and accessible two-hour workshop on how to interpret subjects and symbols in old master paintings at the National Gallery of Ireland, as well as other walking tours focuseing on diverse aspect of Dublin’s history and artistic/architectural heritage. Most Dublin Decoded tours are ticketed paying events but open to the public, with everyone welcome to join. If you’re wondering if there’s a public tour scheduled and running in the next 2-4 weeks then the best action is please see our public tours page on Dublin Decoded. Please note however, we only plan and schedule tours 2-5 weeks ahead ! (Ahead of of running them) So if you’re wondering if there’s a public tour during your visit to Dublin/Ireland in say, 2-6 months, then the best course instead is to join the monthly newsletter, at least for a few months until after your trip * You will find our Newsletter quick subscribe form here. Private and/or bespoke Tours Available? Yes, absolutely. The rest of the time, indeed year round, it’s also possible to also book most of our listed menu of tours as private tours for your own family / your own private group, on a time and date of your own choosing. It’s well worth taking a few minutes to look and browse around our Dublin Decoded tour site to get some inspiration. Once you’ve perused the different walks in the tour menu, if you’d like to book a private tour please send an enquiry to dublindecoded@gmail.com Please help us to help you by including both the name of the tour you’re interested in and your preferred dates in the subject line please. Any other helpful information such as Nationality, likely/approximate number of people in your group, and any special requests, interests, or mobility issues, is also very helpful and should go within the body of your email please. Many thanks. We hope you enjoy this blog, and/or our Dublin Decoded tour site, and perhaps even look forward to welcoming you on tour some time. – Arran Henderson. 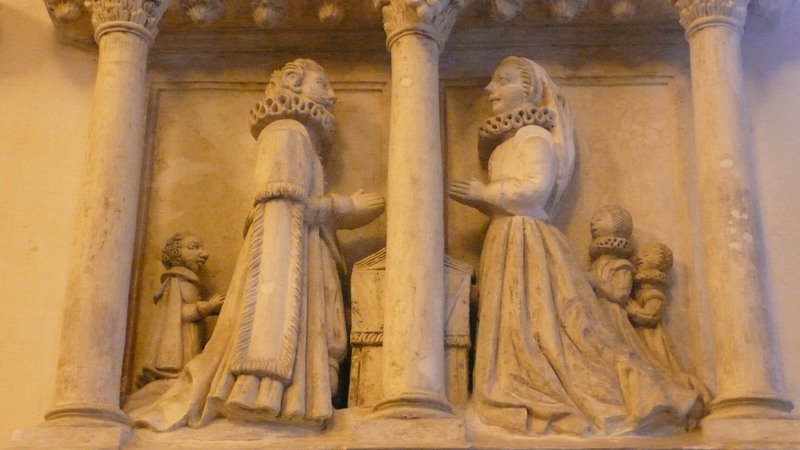 If you can’t book your own private group tour, please join one of our public scheduled tours. These are open to everyone, and run year round minus two short breaks (one at Christmas, another some time in the summer) . Please note that unfortunately we can not answer inquiries about public tours that are not advertised, or inquiries along the line of “Are you running a Georgian/Victorian/Gastronomy/Graffiti tour on Friday morning?” All our public, scheduled walking tours are advertised on our Dublin Decoded Public Tours page. If you can’t see a Gastronomy/Graffiti tour on a Friday morning there, that’s probably because there isn’t one. 🙂 Dublin Decoded tours only run once or twice each month, tend to be quite specialized and tend to sell out. As mentioned above, the best way to know in time when they are going ahead if to join our free monthly newsletter here. – Join the mailing list for our newsletter. Reviews and Testimonials of both my art tours (like the one pictured in the photo above) and of history & building walking tours can be seen on Trip Advisor, here. Enjoy this site: There are multiple articles and posts on various aspects of Dublin and Irish history and art history to enjoy within this blog, from Medieval, Georgian and Victorian architecture and design, to reflections on antique maps of Dublin, the designer Eileen Grey, on Daniel O’Connell and even Ireland’s role in the First World War. You can also use the tags at the foot of each post, to navigate around thematically. Thank you for visiting and for reading. I hope you enjoy this site, enjoy the pictures and content and who knows, perhaps we’ll see you on tour here in Dublin some day. -Arran Henderson | Dublin Decoded. You can follow Arran and Dublin Decoded on Facebook ” target=”_blank”>here. Hey Arran, v jealous to hear about your trip, sounds like you’re having a ball. Really enjoying the blog btw. Greetings to a fellow Night Owl! Indeed! and salutations in return. Had a quick look at your excellent blog earlier, and stumbled across the Orson Wells piece, about Chartes Cathedral. Wonderful, life affirming stuff. Keep up the great work. Hi Arran, thanks for visiting my nordic blog. Gosh, my eyes are getting bigger all the time, reading and enjoying your fine blog about the hidden Dublin and lots more. I can’t tell you how happy I’m to have found your blog and I’m really looking forward to following you as my friend Klausbernd Vollmar (german autor living in North Norfolk, UK where I’m staying at the moment) and myself are going to Dublin for 10 days in November, especially looking forward to experience literary Dublin and the less known sides of Dublin. I found your blog because of your comment at Klausbernds blog. I would like to follow your interesting blog, but maybe, my English would be not good enough. I never have been in Ireland or England. I visited only one English spoken country: Malta. And my Englis is just school English. I’m German and at a short time I life in Switzerland, my husbands birth country. Hi Marion, nice to have you join us, thanks for your comment. Yes, it could be tough, reading a blog in a second language. On the other hand, I suppose it’s a good way to improve your English. Either way, thanks for your visit. Welcome aboard ! Thanks for kind welcome. Have a nice day! Thanks Lomoherz, I shall do my best, to keep you entertained and informed about all things- Dublin ! Welcome aboard. a bon viveur? i love a bon viveur! loving reading. thanks for it all! Thank you in return for your visit and for your kind comments. Most flattered, I am purring here, like a small and happy cat. I am mystified, and deeply intrigued, how you could get from garage door parts to here, (!?) but I’m delighted you did ! Such are the joys to surfing the world wide web, eh? Many thanks for your visit & kind thoughts. I’m especially chuffed if you subscribed, thank you. Look forward to your next visit Phil. very best regards- Arran. also what does the q stand for? Welcome on board Kizzylee, and thank you for your very kind comments. Yes, like you, I am somewhat obsessed with old buildings. I think they have a lot to teach us. If it was up to me, people who kocked them down or otherwise destroyed them would be treated, charged, tried and convicted as just another kind of murderer. We just don’t have the right, in my view. They belong to all and future generations, and our main obligation is protect them. The same goes for nature. For example, very old trees. I’d give them all- buildings and old trees – the same legal status as living people! The q stands for Quintin. Good to hear from you. Please come again. -Arran Q.
Hello Arran– I would love to know more about those two lovely heads up there. 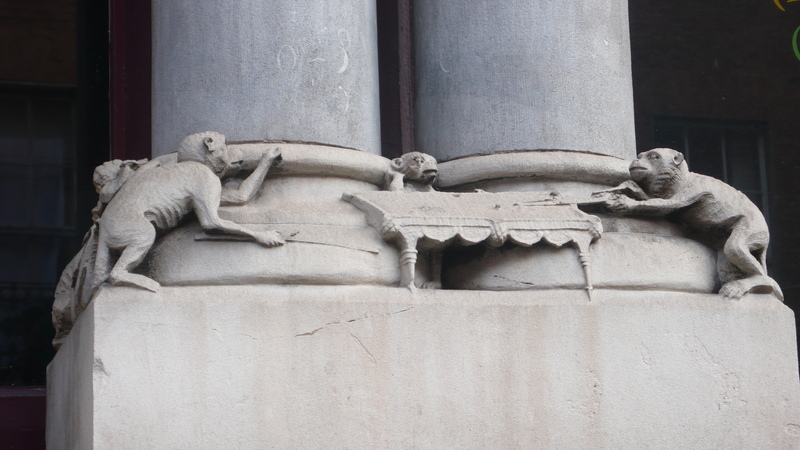 Much sweeter than gargoyles, but oddly reminiscent. Hello Anna, nice to hear from you, I was on your blog earlier today and I loved your year-by-year biog, very immediate, almost cinematic in feel. Thanks for the return visit. The two stone heads above are on the Royal Chapel, a small but very splendid church within the sprawling complex of historic buildings 11th-20th century) deceptively known as Dublin Castle. It was the king of England (and Irelands) chapel when he was in the country and was otherwise used by the Viceroy. 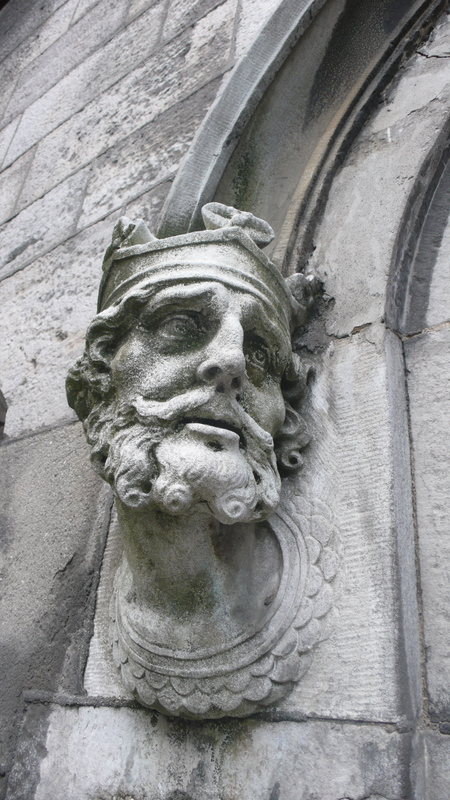 The two heads depict, first- Henry II, who was the first Anglo-Norman king to claim and take control of Ireland (in 1171) and of course the other one is Saint Patrick, our most celebrated patron saint. This picture was also part of a quiz i ran on the blog, see link below. hope you enjoy. Thanks very much for your vist! Hi Carina, thank you so much for all your kind words. I am absolutely delighted to hear from you. It is Saturday night here in Dublin, so I am dashing out the door, but I look forward to visiting your blog and your husbands. My very warmest regards, to you, and to all your family. – Arran. Thanks for visiting one of my blogs. While I do wish to visit Ireland, my main interest would be doing some spoken word there. I do understand that there is a bit of poetry action there… 🙂 Yet I do love history as well so it should be a fascinating journey. Furthermore, I do believe one of my favourite authors was a Dubliner, Jonathan Swift. A Modest Proposal was GENIUS! A bit of poetry action, my goodness, we are coming down with poets here! True, many of them live in the west of the country, hudled brooding round a smoldering peat fire, in a thatched country cottage on some rainy hillside no doubt. But there are plenty in Dublin too, you can hardly move at a Dublin book launch without hitting some Nobel laureate. Merci beaucoup! I shall check them out. Hello Arran – fascinating blog you have here. I love the concept of your book project, “Hidden Dublin.” I get to Ireland as often as I can, which is not often enough – unfortunately there’s an ocean in the way. At any rate, I look forward to more ‘virtual visiting’ via your blog site. Thanks! Your students are lucky ones, it’s not that easy to find someone so much into his words and passions. I’ve read your “The origins of Saint Patrick’s cathedral” (yes, that was pretty intense but definitely worth it) and I just wish I could take the first plane to Dublin. hi Bianca, very nice to get your return visit and thank you for making the investment in the piece above, and for such kind and generous words. My students might not agree.. (but what do they know?) 🙂 Regards & respects- Arran. My father is a history fanatic. Most of his interests involve American history, especially the Civil War and WW II. Anytime I move to a new town, he tells me its full history before I’ve fully unpacked my boxes. I’ll have to tell him about your blog. I think he would love it. I’ll enjoy it too. Certainly anything you tell me about Dublin would be news to me. Thanks so much for visiting and comment. Yes please, I’d love if your dad paid a visit too. i suspect we might have interests in common ! -Arran. thank you Maarit, I was delighted to discover your second blog, just as good as the other one, which is no mean feat! best and warmest regards- Arran. thank you Paula, it appears we are of a mind. I shall try and find your posts on blog awards soon, look forward to reading your arguments & views on this vexed topic. Thank you for your kind and generous words, I hope you’ll visit again and again. best regards- Arran. I love the Irish and their culture. God willing I’ll be able to get there one day and experience the country and its traditions. I’d also love to learn a little bit of Celtic if possible. Keep up the great work. Have a Merry Christmas and a Happy New Year. Many thanks for your visit, and your kind comments. Had a look at your site, love the photography. Keep up the good work, and have a great Christmas! Thank you for your kind compliments indeed, they are very much appreciated. Wishing you a blessed Christmas and a Happy New Year. Many thanks for the vist and for your comments. I hear what you say about the difficulties of travel, but I hope somehow, someday, you do get to visit Ireland. Forget Bunratty Castle and the Guinness storehouse and all the tourist nonsense, but make sure you rent a car and spend a good few days on the wild peninsulas of West Cork, especially Beara. So beautiful… Hope you make it over someday. Best of luck with everything and hope 2013 is a good year to and for you. Regards and respects- Arran. It’s so nice to meet Arran. Your blog sounds fascinating, and as I have some Irish in me, I always enjoy learning about Ireland. And, how enlightening to learn about it through architecture and the history of its buildings. I look forward to it. I’m intrigued by the Hidden Dublin postings. Is there a book available? Can’t spot one on Amazon. Hi Susan, very nice to hear from you. not yet is the short answer. As you saw above, I had a column on that theme and Hidden Dublin title, for a few years recently (and I’ll be guest presenting on radio soon) but I have not quite edited the Hidden Dublin book to my satisfaction yet, although I must have written it (the book of the Hidden Dublin series) about 3 times over by now. I need, joking aside, a good editor. I have however just completed a separate book, a shorter spin-off book; and, by a happy coincidence, I think you may be seeing this smaller manuscript quite soon. I shall not say more about it here, for obvious reasons, but my very best regards- Arran. That’s great news Julie, and you’ll be very welcome here whenever you make it over. Hope you find much to enjoy among the pages of this blog, naturally I’m delighted you subscribed. 🙂 When I am travelling myself I always find that the more I learn about a place in advance, the more I enjoy the sights on the ground. It’s always great to have a bit of historical framework, suddenly the reasons for things become clearer. The design of churches, for example, and even the names of streets, suddenly all start to make sense. Hope you’ll find this blog of some use to you in that regard. My very best respects- Arran. the country of the great Samuel Beckett! hi Jussara, thank you for your visit, I’m delighted that you looked around and found a few things & stories here to enjoy. Thanks for your kind comments & likes, I’m especially flattered you subscribed. You are right that this Ireland is “the land of Beckett” but as you know, he, like half our other best writers, went off to exile by his mid-20s to live and work abroad. (Paris of course in his case) But we’ve learnt to appreciate him now. I am very lucky to have a wonderful B&W portrait photograph, a real one I mean, the original, of Samuel B himself, it was taken by his friend John Minehan in Paris around 1980, and is now sitting near my desk here. If ever I am tempted to send out a manuscript half-finished or not as good as I can make it… then one quick look at Sam’s stern face soon teaches me a lesson!! 🙂 Look forward to your next visit. – Arran. I’ve never been to Dublin, but, as with just about every place in the world, I can’t wait to go. (Except the South or North Pole. I like penguins and all, but the Poles just look too cold!) I am envious of your recent trip to Paris. It’s been a while since I was there… Thank you also so much for stopping by my site. I will surely be back by yours!!! I also meant to say, I love history and the English language as well. Have you ever seen the silent film “St. Joan of Arc”? Stupendous. hi Jessica, Thanks for the visit and the comments. i really liked your blog too, and even clicked through the links to one of your pieces for the local paper, on that elderly veteran, wonderful man, and an excellent piece, (very self-effacing piece, you made sure all the focus was on him and him alone, exactly right) I hope you make it to Dublin and Ireland one day (look me up if you do) and indeed hope you get to all the other places you dream about. To answer your question, of course there are many, many films about Joan of Arc, (over 35 of them!) and I’ve seen a couple, but you say the wonderful Silent film so you must mean the famous 1928 The Passion of Joan of Arc (La Passion de Jeanne d’Arc) directed by Carl T Dreyer. It’s very famous, still considered a masterpiece (as you say yourself) and so I’m aware of it, but I regret to report, I’ve not seen it yet. With your heartfelt recommendation, perhaps I shall have to go out and find a copy now. I understand it is entirely centered on her trial, based on the original 700 year old transcripts, which i think survive, (miraculously) to this very day. In fact these manuscripts were use to re-examine the (grotesquely unfair) trial and thus used to rehabilitate her, a rehabilitation which, believe it or not, only happened officially in the early 20th century. Another detail I remember from my research is that even the people at the trial- who were of course generally very hostile to her- were still dazzled by her intellect. She managed to cleverly avoid several nasty traps. I think we always think of her as very pious and physically brave and as a visionary, but not many people realize she also managed to outsmart a bunch of powerful, hostile, scheming, highly educated men, canon-lawyers and so on. Not bad for “a peasant girl”. Anyway, that is probably a lot of information but anyway, thanks for the visit and comments, and come again some time. -Arran. Excellent. yes, let me know when you’re coming and we’ll do coffee and a cathedral. 🙂 I’ll tell you about St Patrick’s; and you can tell me about the crusader forts in the Levant. As you’ve guessed, I really like your blog too, & already looking forward to reading more. all the best, & thanks for dropping by. – Arran. Anyway, I’m delighted you found the blog and you enjoyed the material, and the approach. Just payed a quick reciprocal visit to your blog, looks articulate & interesting, & I shall return. Do come visit again here, and let me know how you get on. My warmest regards- Arran. I don’t know much about architecture, but I do argree that building forms a text about us and our cities. I enjoyed that sort of thing more when I lived in New York, rather than here (San Francisco area), but it still holds true. We’ve had some “hidden” project in various parts of the country and they are worthy efforts. They grab and expand our interest in a different sort of way. Can’t think of Dublin with thinking of a bouquet of writers and poets. That’s another way to get to know a city, though its writers. very true Jamie, about knowing a city though its the writers, although as you know, in our case we banned their books and drove half our best writers into exile. But you are still dead right. Did you know?-Joyce used to boast that- if ever Dublin was destroyed- it could be rebuilt from scratch, using Ulysses as a guide! It’s not entirely true, but it sometimes feels that way when you read it. A lot of it still survives of course. If you know that book well, you find it oddly comforting walking the streets of Dublin today. Very nice to meet you, hope you’ll come again. -A.
I really like Irish culture, I’ll be back soon! excellent. 🙂 look forward to your visits. I loved this description and I read every bit of it. I love how you wrote that the fabric of our cities form a kind of text This is so true and a beautiful visualization of the richness of history “woven” into the stone and brick and marble and architectural details of old cities’ buildings. The bones of the past left standing long after its builders have sunk below the earth. I am a Bostonian so pardon my calling my city an “old city” – nothing in American is truly old expect the prehistoric rock and the land and sea – but by American standards my city os the most European and historical. It is heavily influenced by the UK and by Ireland in it’s architecture and culture. Growing up I delighted in walking it’s winding, terribly confusing streets (for drivers) but charming for pedestrians! – enjoying the hidden gargoyles and stone flourishes, trying to get a sense of the stories of the past as I memorized each alley way and pathway and rotary. I’m re-reading Ulysses by James Joyce right now and I recall someone writing that he recreated Dublin in his words as though he relaid the city out on a map – and everything was in it’s perfect place? I so desperately want to visit Dublin and go all over Ireland, visit some ancestral places and do a Bloomsday walk. I’m going to go pour over some of your archives now! Pardon my damn typos, the autocorrect on my mac is an idiot. hey thanks Champagne for reading the post so closely, and for responding in such generous terms. I was in Boston,but only once & so long ago, but do recall it being utterly charming and lovely and indeed full of fine 18th & 19th century architecture, some even older. It was very late August or early to mid September but either way, the weather was beautiful. Have just one very clear recollection, in the sun, in the Cambridge area, of street drummers drumming and the students (just returning to University) and even a traffic cop dancing to the beat and everyone was dancing & smiling. I was about 19, it all seemed so extraordinarily prosperous and confident and positive, so America, (so Kids from Fame!) like another, different, world, to the sometimes grey & dreary Ireland of that time. Oh, I do remember going out in a boat in the bay too. All the planes and yachts zipping around. Gave me similar impressions. Hope you find much to enjoy here, great to make your acquaintance. – Arran. What a picture you painted of your long ago visit to Boston! Impressions and moments… The stuff that makes up life, especially the best bits of travel. I am right now sitting in the breakfast room of the Taj in the heart of Boston as I write this; this is the spot next to the public garden (a park) which was once the old Ritz. I had to dodge melting dirty snow to get here upon finding a rare decent parking spot. I passed an old building with one of my favorite features of Boston architecture – copperized awnings! Gorgeous brilliant things – a lovely swirl of detail and flourishes on an other wise stern faced stone building. Your blog made me remember how I used to wander round the area and focus on the architectural details and want to shoot it but almost never did – I am definitely going to once proper spring arrives. I don’t live in the city anymore but I am happiest when I visit it on the weekends. A dreary colder greyer Ireland.. That’s how this winter had been here! I wish us both more green and blue. Someday I’ll get myself to Dublin by hook or by crook. Tell me, have you ever been to New Orleans? It’s a wonderfully alive, colorful city. It’s Paris meets the Caribbean. I went on a travel jag there from 2005-2011 – – 11 visits : all amazing, vivid, unforgettable. Hi, and excuse my tardy reply. No, I have never been to New Orleans, but of course I’d love to go. The closest i’ve got so far is watching David Simon’s “Treme” ! Love to go some time and experience all that. Hope all well- A.
Hi Samantha, thank you very much for the idea, and the nomination. Very kind and I’m flattered of course, but I won’t be able to accept. I have a sort of policy about not accepting peer awards. Take another look at the ‘about the author” post, just above, and you’ll see my reasons. Hope they make sense when you read them. Thank you though again, and my very best regards. -Arran. My very thought was “someone didn’t read the about page before posting!” which happens to me about 25 times per week on my tumblr. The same five questions I’ve answered in my FAQ and put on the message thingy please read the FAQ first. Ha. Oh well. You’re very polite about it. Thanks for popping up again, Arran. I llove your blog and don’t get back to it as often as I should. I love Dublin but it’s years since I’ve been back. Nice to visit by proxy though. my pleasure Jane, it was nice to visit your blog too. Many thanks for the return visit, and the kind words. Nice to hear, in a way that you miss Dublin, and I’m very pleased if my little blog is any consolation. Have to say looking at your wonderful pictures of the Garonne, that where you live looks very beautiful, I love france and even felt a little jealous! Also just saw your astonishing picture of a (butterfly? moth? )- lava, absolutely enormous, quite horrifying ! 🙂 Good luck with all the new books coming out, sounds like a really very exciting time. my best wishes with it all. -Arran. My other top tip for Ireland, more for if you come with a friend or friends is not for cities but to visit the West of Ireland. Connemara, the Burren and the Aran Islands are all fantastic. On the Aran islands they have 400 foot cliffs, it looks like a moon scape and the local people all still speak Irish. Most of all I love West Kerry & West Cork. In West Kerry, avoid Killarney, which is a tourist trap, and even avoid Kenmare too much, although it is pretty, has nice food, and is a better hub than Killarney. Seek out the Dingle and Iveragh Peninsulas, and absolutely go to Skellig Island, via a day-trip on a boat, it is an extraordinary place, magical and utterly unique) In West Cork, the Beara peninsula is my personal favourite, but just further south – (is it time for Google maps now?) – places like Baltimore are also very nice, with Sherkin and Cape Clear islands out in the bay) This whole region in general is the Atlantic edge of Europe, with ancient mesolithic monuments, and a very special atmosphere and landscape. You will not find anywhere in England or France quite like it, or indeed around the world. OMG. Promise me you will show me around if I ever get there! 😛 Just reading your replies makes me feel as if I were already there! Aran islands and Benara peninsula caught my attention in an instant. Love the description. Sounds like the perfect places for an escape from the bustling city! Yes, the west of Ireland is indeed wonderful. I’m biased of course, but I’ve been lucky enough to travel quite a lot, and I still think the whole West Cork/west Kerry region is once of the best & most beautiful places in the world. I am sometimes away or busy with teaching or writing projects, but if you make it to Dublin you’re absolutely welcome to drop me a line, (preferably beforehand), and if i possibly can I’ll meet you for a drink or a coffee at the very least and give you any local advice I can. Best of luck- Arran. We have a lot in common! I’m an educator and traveler. I love Dublin! IN fact, I will be revisiting the lovely city in December for News Year’s. Your post is awesome. Many, many thanks Cindy. Make sure you read my “Top Dublin Sights” post before you come. And after that, please feel completely free to drop me a line if you want any further advice. Thanks for your support. -Arran. Agradecida por tu visita y comentario en mi blog. Te deseo una hermosa semana. Gracias a te (tu?) tambien Marta, por tu visitas y comentario. ?Eres de Argentina? de Buenos Aires o donde? Lo siento, il mio Espanyol esta horibile! Anyway, nice to make your acquaintance. Encantado. -Arran. Hola Arran, efectivamente soy de Argentina y vivo en la provincia de Buenos Aires. Por el idioma no te preocupes, yo uso traductor de idioma. Que pases una linda jornada de jueves. hola Marta, y gracias. 🙂 una linda jornada de jueves a te tambien. Hi Arran – You definitely exude a sense of curiosity and openness…which is great! Look forward to following you! ~Sherry~ p.s. I’ve never been one much for history…although I know it can teach us a lot about the present! ah ha. I, on the other hand, can hardly get enough of history. No matter Sherry, may thanks for your visit and nice comment (I love your blog too have to say) Nice to have you on board. – Arran. Congratulations! You’ve been nominated as a VERY INSPIRING BLOGGER by Jadi at jadicampbell.wordpress.com. Go to her most recent post to see your nomination and learn about the award. THANK YOU for sharing your experiences and ideas with the blogosphere! Many, many thanks Susan, both for following the link to the new blog, and for attempting to subscribe, and most of all for alerting me to this issue. I downloaded the Jetpack, including the subscribe button/feature, but it just is not appearing on the new Dublin Decoded blog/site, and nor does the Widget bar appear on the Appearance drop-down menu in the Dashboard, (where it normally would) very frustrating, and embarrassing. I’ve been searching and working on it last 2-3 hours and still no solution. Going to call in the cavalry, (or at least some experts) tomorrow and dearly hope to have this vexed issue resolved next day or so. Thank you very much for getting in touch about this, much appreciated. -Arran. You’ve been nominated for an award. Another picture for your collection. Also, quite frankly, i can forgive Jane anything, she has been so supportive to me. My only main concern, apart from the slight “chain letter” feel, is that doing so would be very time-consuming. On those occasions when someone has been kind enough like Jane, and gracious enough to nominate me for one, I politely decline, but often glance at the form, and what is required. What has struck me is that there often seems to be a lot of stipulations, of lists to fill out; other bloggers to nominate; other people to thank. It’s all very civilized and mutually supportive and kind, and all that is of real value. But my own purely personal and gut feeling, (and I may well be wrong about this) is to spend that same time instead, working on our writing, reading each others blogs, and also where possible making worthwhile comments and contributions. In my own defense, i do try to visit other peoples blogs, to rad closely and attentively, to like, to thanks and where possible to comment, when I have anything worth saying. (or even, sometimes, if I don’t!) So I think I am reasonably supportive, and “community” minded, I hope. But I don’t know. Does anyone else have any views on this? Has anyone gone from “accepting” to “not accepting” ? Or in the other direction? I have very fond memories of my time spent in Dublin. Growing up around NYC you have to look really hard for anything “old.” We’re always in a state of constant demolition and construction (it’s how I met so many Irish guys in my twenties). All of the posh neighborhoods of the 1840’s fell into tenement housing by the 60’s. Mansions were demolished ten years after construction as the rich moved up 5th Avenue. It’s so interesting to see how people’s opinions and pocketbooks construct a place. I’ve always wondered about people who don’t like trees on their streets because they’re messy. That is very interesting, and very sad. There was similar philistine-ism here too, hundreds of old houses died or were knocked for develop the sites, (often hideously) or else died from neglect and were then knocked. Especially in the North inner city Dublin, which in the 1720- 1801 period was rapidly developed in splendid style & where the cream lived. Then turned to tenements in later 19th and thru 20th Cs, and suffered huge loss & destruction. Sorry to hear there was not more protection for historic housing in NYC. I have a NY blogger pal who sent me pics, of her favourite terrace in the city, really amazing, stunning, Greek-Revival mansion houses. Almost all gone now. This is more or less why I write this blog. Although as with all these things one finds one is preaching not even to the converted, but to fellow aficiandos. Oh well, all we can do is our best. Thanks for taking the time to comment. -Arran. PS: was amused to hear about how you “met so many Irish guys” involved in construction & demolition. Personally, I hope we were more… constructive. It was during a construction boom in one of my favorite New Jersey towns–Hoboken (Frank Sinatra’s birthplace). I think mostly the Irish guys were just fun 🙂 which in a way is a very constructive thing. In reply to the question above. I only met Seamus Heaney once, and like you, my recollection was his presence, and just thinking how nice and kind and twinkly-eyed he was. I suspect i was bit star struck ! My other main memory is going years ago to hear a lecture he gave in Oxford, when he had, was, the chair in poetry in the University there. His theme was the “Responsibility of the Poet” and he spoke about Emily Dickenson mostly, and John Keats too. I hope that helps? How about you? My very best regards and respects – Arran. Hey thanks for the like and comment on my blog, you have a great blog here. Thank you Nadja very gracious. I am delighted. Hope you like it. You’ll find there’s a lot here to read, to explore & to savour. Drop me a line and let me know how you “get on”, as we say in Ireland. 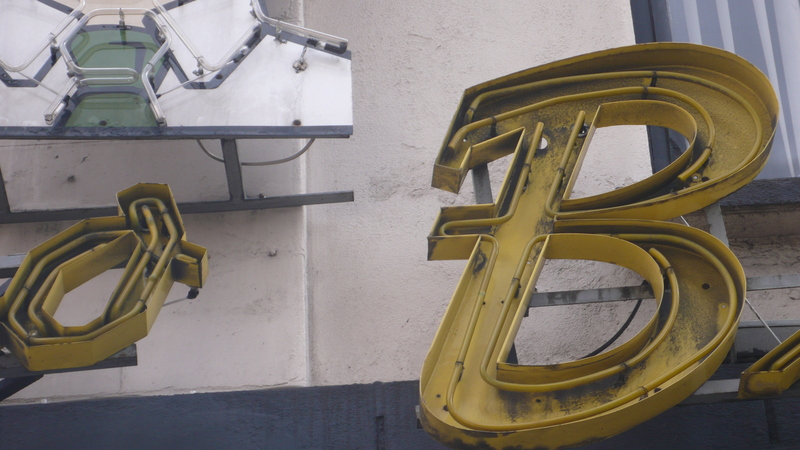 But in the meanwhile, enjoy the blog, and enjoy Dublin. You’ve got a very interesting blog. Thank you Vinnieh, glad your’re enjoying it and thanks for commenting, and subscribing. I like the look of your own blog too, have just read two of your reviews- both on films I love “They Shoot Horses, don’t They?” and (that masterpiece) “Black Narcissus”. Keep up the good work, and come visit again soon. -Arran. Hi Arran, nice to meet you. I’ll look you up if we ever get to Dublin. I’ve wanted to go to Ireland since I was 14 and spending all my free time singing Irish/Scottish/Australian folk songs. It was a long time ago . . . . . .
Hi Alison, many thanks for the kind comments. I paid a visit to your blog and found one of the Buenos Aires posts, enjoyed that, (I left a comment there) 🙂 If you do make it to Dublin one day, yes absolutely look me up, would be great to have you on one of our walking tours. My very best regards- Arran. read your take on 1916-1923 and agree that you have it right. – I also got the ‘improved’ IntercertIrishhistory version – we have much to remember perhaps, but little to celebrate. Thanks Connor, I appreciate that support. Thank you for taking the time to comment, makes a difference. I love history. Your blog is very interesting; I am following it. Please check out my blog. You may find it to be of interest to you. May our Lord Jesus richly bless you. Delighted you found the blog and are enjoying the history so far. And may thanks for following pastor. Very glad to have you on board. I am pleased to discover your blog. It’s late I need to visit again for a proper read. Thank you for this first visit, and your kind comment. And yes, do come again some time. You’re always welcome. Louise, hello old pal! I’m delighted! Thank you for your lovely message. Enjoy Paris. (Yummy!) Have you walked the elevated linear park Promande de Plante yet? I’m sure you have, sure know it well, but it was a new discovery of mine, Easter last year, in a city I thought I knew reasonably well! Have fun everywhere. The Natural History museum is great, astounding in fact. Do please, give my love to Ronan and Juno and Ruben. Big love to you all! -Arran. You have some really interesting images as I read from Tóirdhealach O’Braoín. Would I be able to use them in my research or would I need to contact Tóirdhealach? Hi Jen, I think the images you refer to come from the DCC photo archive (which is online) but I’m not sure which ones you mean, tbh. So please contact Tóirdhealach O’Braoín if the images are from him? As you write to him (you’ll find him on Facebook) also provide him with a link to the article (?) so he knows, and can see quickly- which images and which article you refer to? Always a good idea to have a link, and that should help him see which images you mean. Good luck with all your work. I’ve given one or two walks/talks for DIT design over the years. Best regards -Arran.